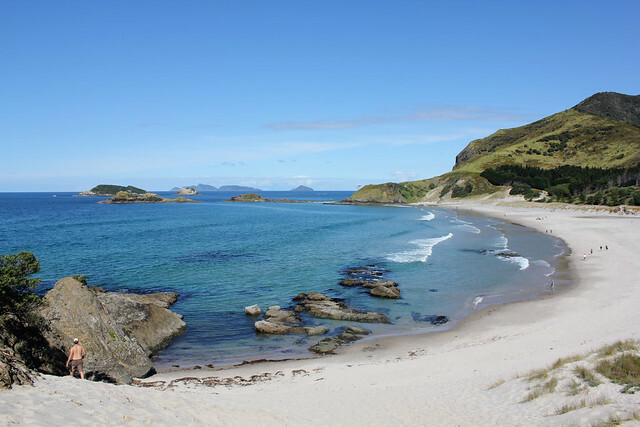 Pahi was beautiful most days, although very rainy a few. We made steady progress on Elaine & Grant's house, and had a lot of funny conversations between the six of us. 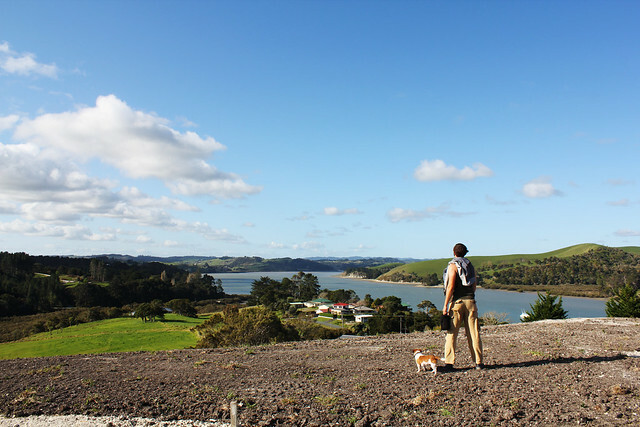 Sam and I went for a walk around the small peninsula of Pahi one afternoon. While walking, a happy little dog I decided to call Pepe emerged from the woods and followed us home, entertaining us along the way. 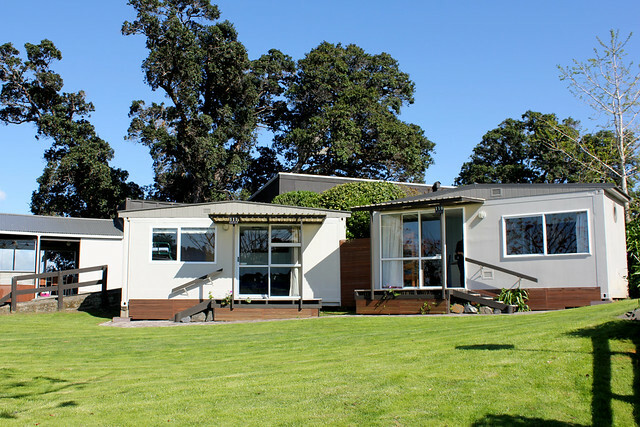 We were interested in the Kauri Museum when we first heard of it, but when we found out it would cost $25 a person to get in, we decided to skip it. On Saturday, the day we were to leave Pahi, Grant heard the museum was offering free admission in celebration of Settler's Day, so we stopped in before heading to the Blue Heron. 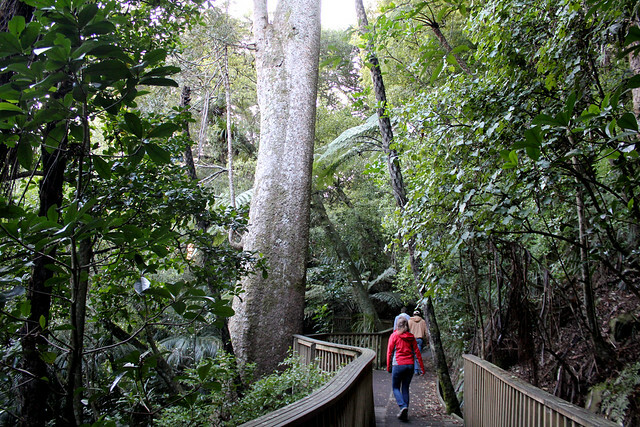 The Kauri Museum is named for the kauri tree, which is New Zealand’s largest and most famous native tree. The kauri is a type of conifer which grows in the subtropical northern part of the North Island. 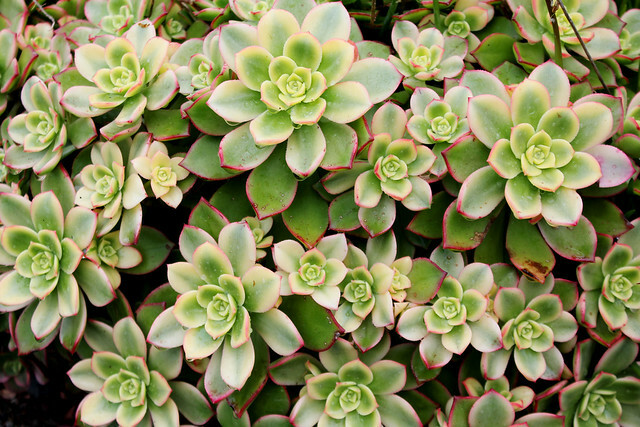 They can reach massive sizes and live longer than 2,000 years. The museum has rooms full of things made from kauri wood, from sculptures and wall hangings to ornate furniture. 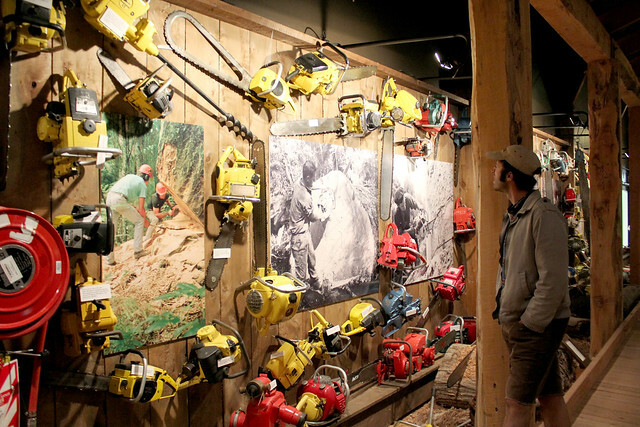 They also have historical items from the logging & gum-digging culture surrounding the kauri industry. For Settler's Day they had all sorts of special events on, including a log splitting contest with burly ax men, arts & crafts, butter churning, etc. 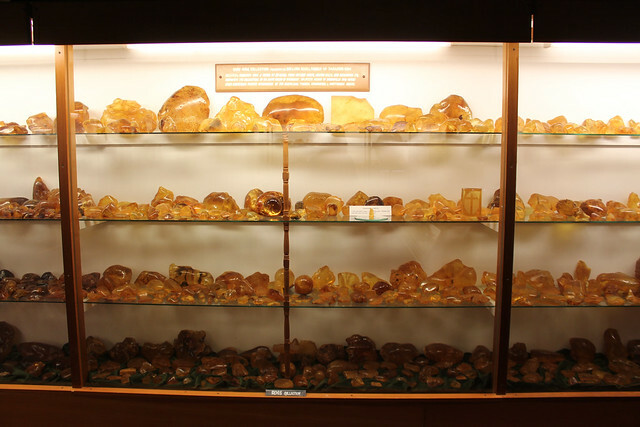 They also have an entire room in the basement dedicated to their collection of kauri gum, the fossilized resin of the kauri trees. 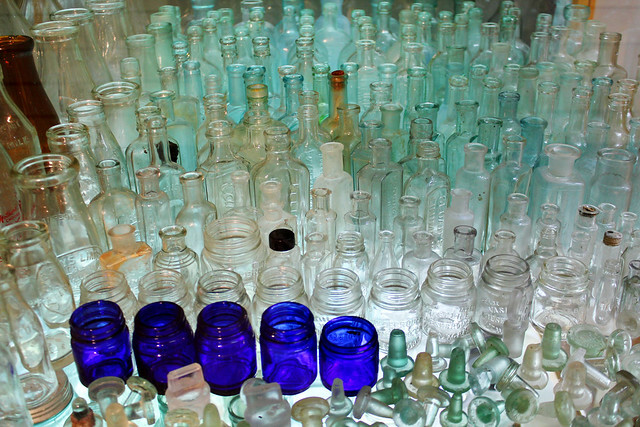 Sam was interested in the wall of chainsaws, while I found some interesting collections of antique bottles. 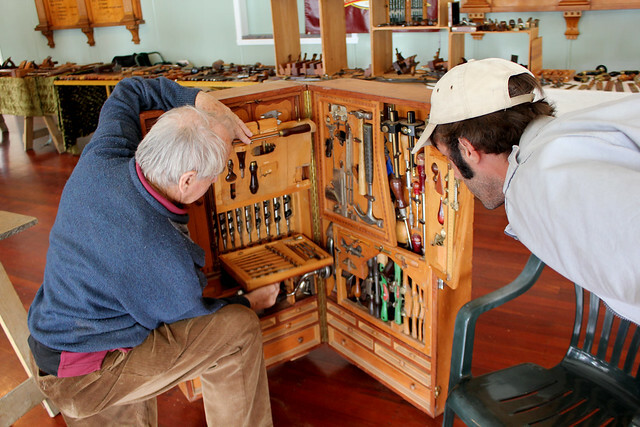 The Vintage Tool Collectors Club had a room with things on display, and Sam and I met a very nice man who built an amazing tool chest with many different panels that could be opened to reveal even more tools below. Every tool had a special cavity built to hold it. I think Sam and I could have talked to him for hours about tools, travel and craftsmanship. He told us if he hears of any joinery apprenticeships, he'll let Sam know. Finally, after a lovely afternoon at the Kauri Museum, Sam, Tom, Emma & I drove to the Blue Heron, Grant & Elaine's holiday park outside of Whangerei. On a side note, the Maori pronunciation of WH is an F sound, so Whangerei is pronounced Fawn-ga-ray. After visiting the pharmacy in town, I joked to Sam that if I owned a pharmacy in Whangerei I'd name it The Wharmacy. The Blue Heron is even more beautiful in person than in photos. 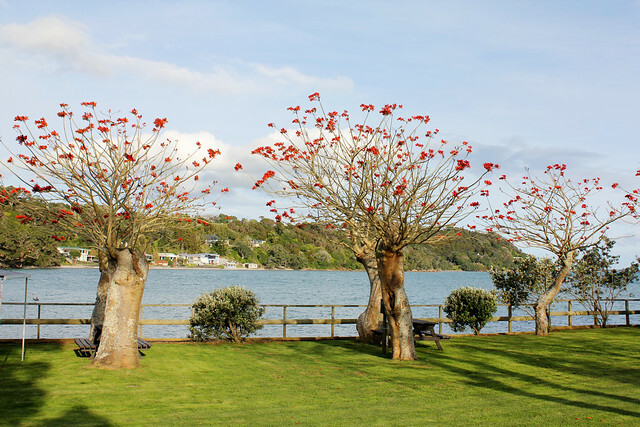 Bright red "flame trees" line the small peninsula where we're staying. I had the opportunity to do a different kind of work than I've done so far through HelpX, taking photos of the holiday park for Elaine & Grant, and designing a cover for the digital release of Elaine's book. We're staying in the cabin on the left, which was converted from an old refrigerated shipping container. On Sunday we were blessed with a beautiful sunny day, so Sam and I went to Ocean Beach with Emma & Tom. 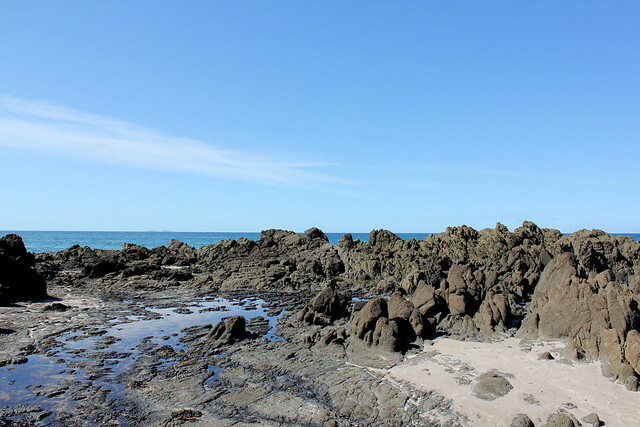 We haven't been to a beach properly since we got here, and we had a lot of fun exploring the rocks while Emma & Tom soaked up some sun. It was too cold for us to swim, but I did get my feet in the water a bit. 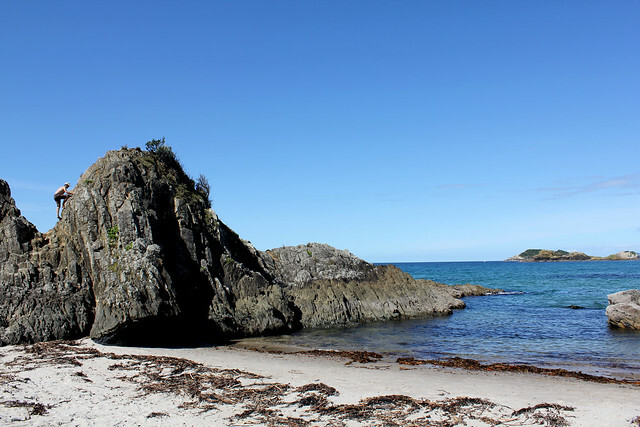 After Ocean Beach, we drove through Whangerei looking for the Whangerei Falls. We didn't find them, but we did find a nice canopy boardwalk through the Kauri Forest, which ended at a smaller waterfall. Today we're going to check out the Abbey Caves. It's been pouring rain on and off, so I'm pretty sure we're going to get soaked. Lucky for me I found a second pair of tennis shoes in a thrift store for $5, so I can afford to get wet feet. If you're reading, this Maia, happy birthday! I think Sam must have been salivating over the tool chest with a place for every tool! Nice Work! The photos of the beach are simply beautiful! I can imagine the book cover will look beautiful too! She has a top notch professional doing the work! Anxiously awaiting your next blog!